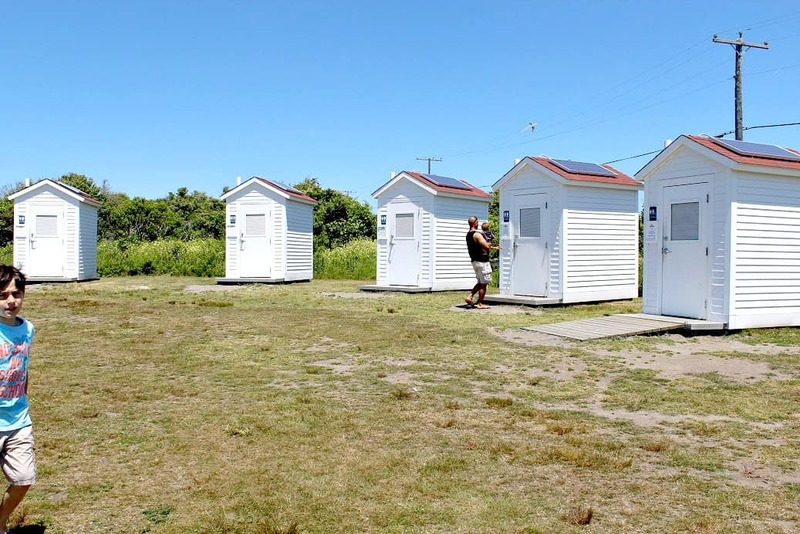 See how we did Rhode Island in a day, with kids! We recently went on our first family vacation since our youngest son Benjamin was born. He’s 13 months now and we thought a short road trip would be the best way to travel with him at this age. I had never been to a lot of the New England states so, we decided to travel north this year! Our original plan had us traveling to Rhode Island, New Hampshire, Vermont, Maine, and Massachusetts, but we ended up narrowing it down. We planned a stop in Rhode Island, then it was north to Maine, and finally, a quick stop in Massachusetts. This is how we did Rhode Island in a day with our kids! For whatever reason, years ago I decided I would love Rhode Island and just had to make it there someday. 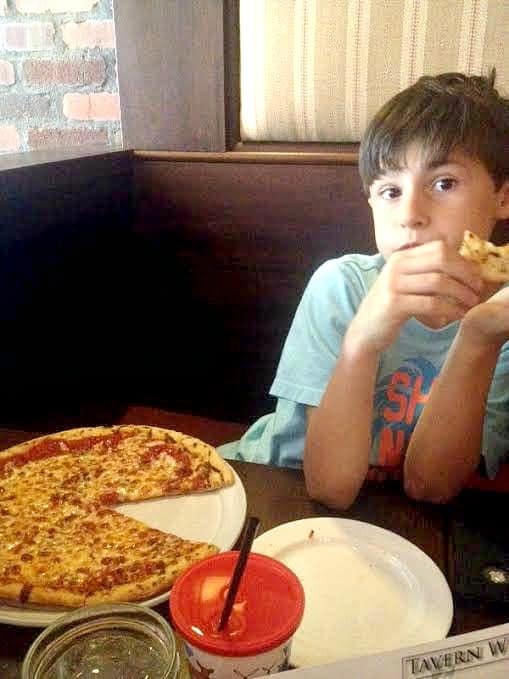 Before we headed off on this trip, we did a lot of research on where to take the kids and where to eat. We had only planned to spend one full day in the only state smaller than ours, so we wanted to make sure we made the most of it! 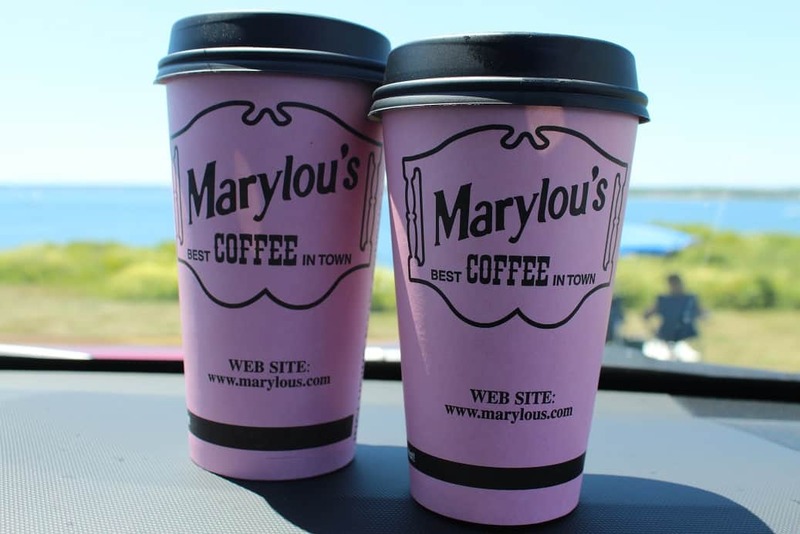 After grabbing gas and some really good coffee from Marylou’s inside of the gas station, our first stop was at Beavertail State Park. There was a lighthouse and museum, a small “aquarium,” and a ton of rocks heading down to the ocean. The park employee in the lighthouse was the most interesting man! He actually lived in the lighthouse as a young boy when his father was the lighthouse keeper and told us some really cool stories (and some really sad ones!). 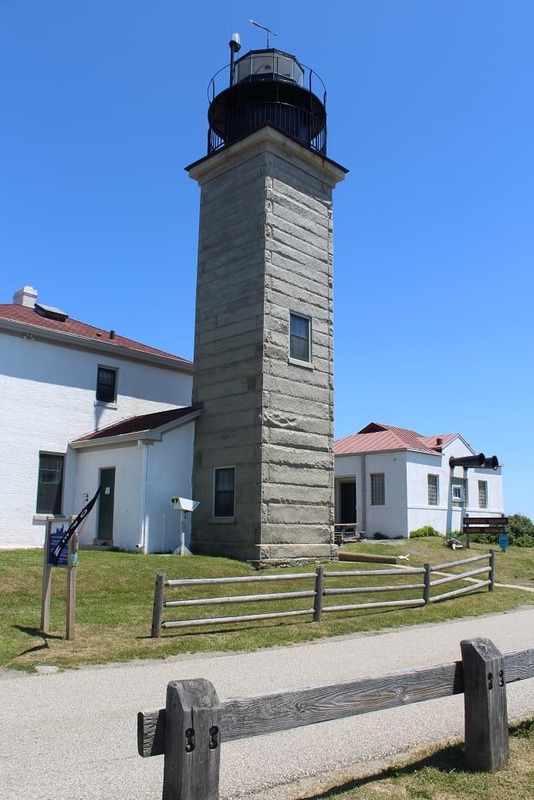 This lighthouse no longer has a keeper and now serves as a museum. We learned that there has been a ton of shipwrecks in the New England area – most occurring many years ago. The aquarium was a small building right outside the lighthouse. There were several fish tanks inside containing different marine life commonly found in the area. We saw lobsters (of course! 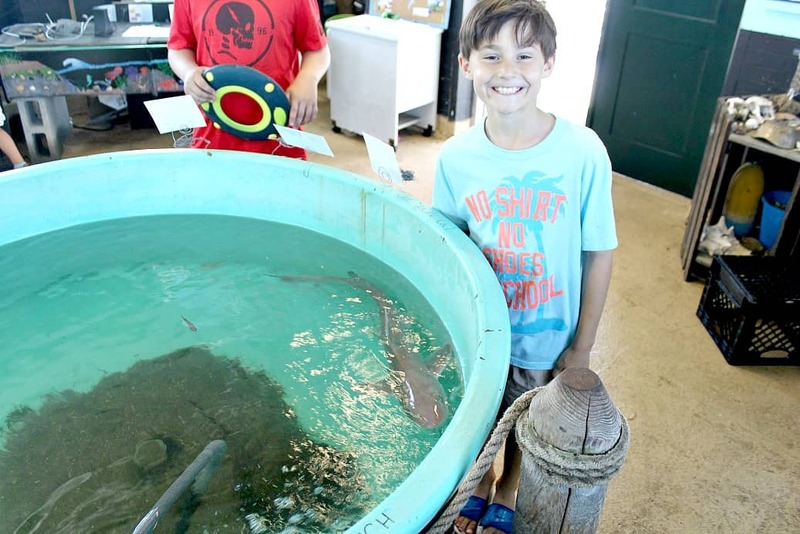 ), a few different fish species, and a shark! Jaxon loved seeing a shark up close in an open tank! Again, the park employee inside was friendly and very informative! Pretty sure this was the exact place we all fell in love with Rhode Island! 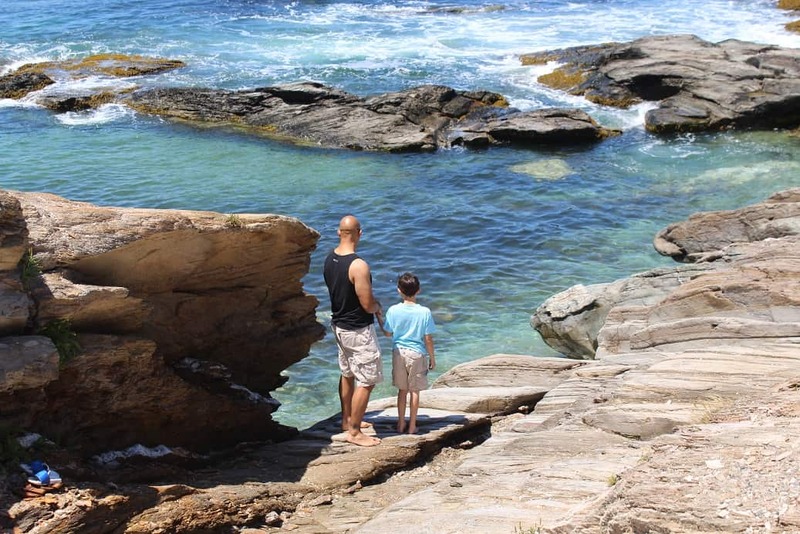 Jaxon and Daryl climbed down the rocks to the ocean and explored a few different areas. Benjamin and I were able to make it down to one area so we could snap a family photo. Jaxon had so much fun that it was hard to pry him away to grab some lunch! On the way out we stopped at the cutest little outhouses for a bathroom break! Our next stop was Newport to do part of the Newport Cliff Walk. 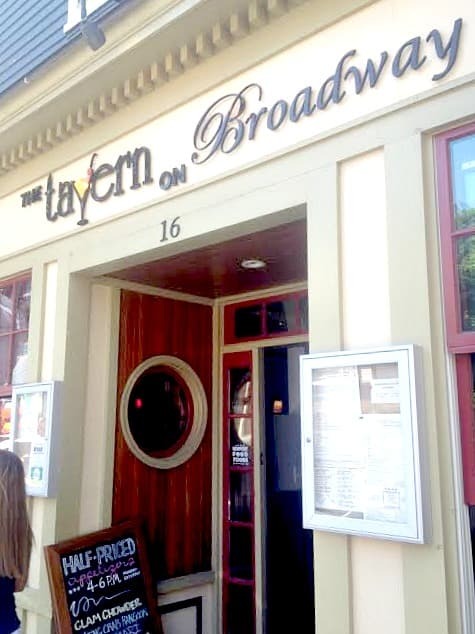 We decided to grab lunch in that area and ended up at The Tavern on Broadway. It was so good! 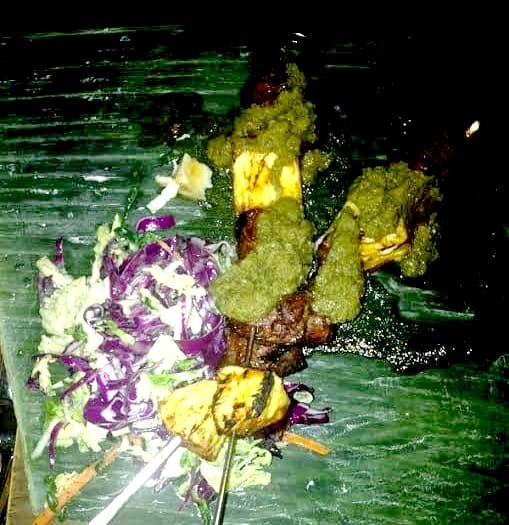 Jax had kid’s personal pizza, I had the Shrimp Mozambique, and Daryl had Sweet Chili Wings and Steak and Pineapple Skewers that were served on a giant piece of a leaf! 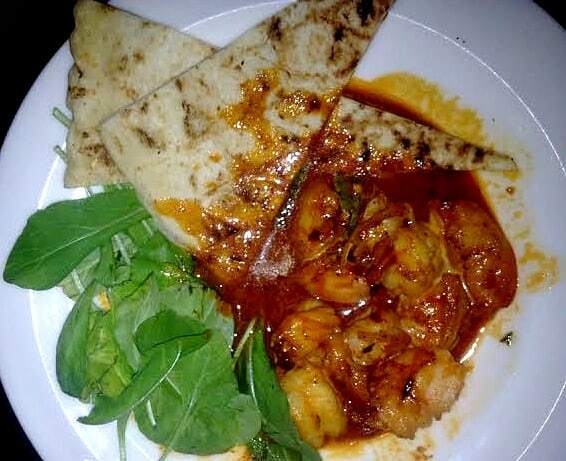 Please don’t go by my awful iPhone 4 pics – this food was amazing and was presented to us much nicer than my photos show! I’d definitely recommend checking out this restaurant if you’re planning on spending any time in the Newport area! 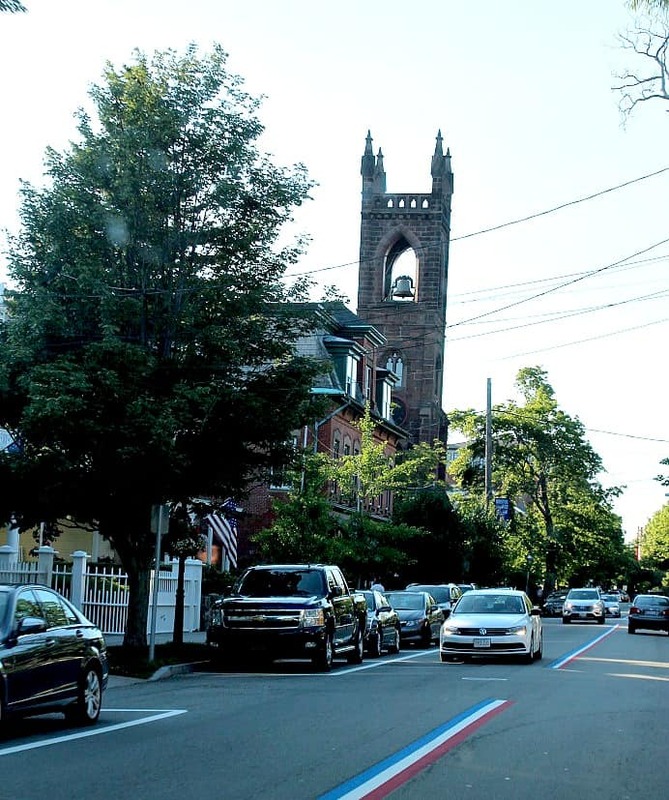 Newport’s streets were painted red, white, and blue for the 4th of July! After lunch, we headed over to the Newport Cliff Walk. Again, the scenery was just beautiful. The walk is along the backyards of huge mansions. Most of the walk is paved and stroller friendly, but there were some steps and we had to stop where the pavement stopped. On foot, you could continue on if you were willing to walk along large rocks. Where the paved area ended, you could also climb down the rocks to the ocean. Of course, Jaxon and Daryl had to do more exploring! Benjamin and I were perfectly happy to have a seat and enjoy the view! 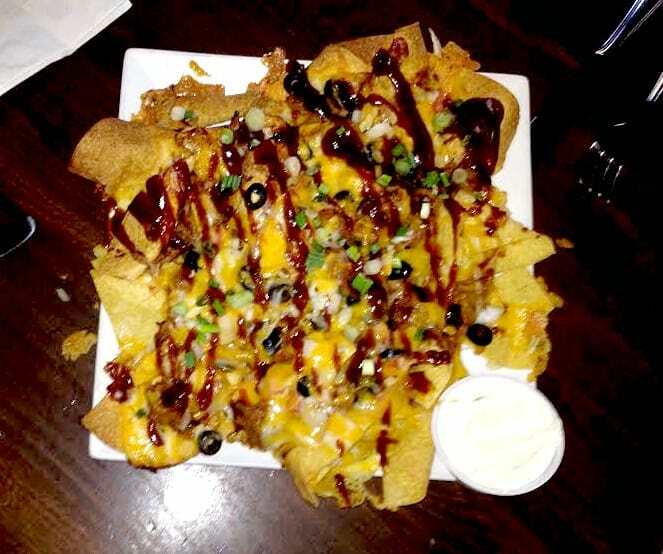 We had dinner at Fat Belly’s Irish Pub in Providence, Rhode Island. While the food was really good, and they did have a kid’s menu, unfortunately, we ended up seated near some rather obnoxious, crude people. Thankfully Jaxon was so tuned into his tablet that he didn’t even notice all the inappropriate language (yes, it’s a pub, but it was bad). The Pulled Pork Nachos were delicious (again, an awful iPhone 4 pic – I’ll definitely be breaking out the DSLR on our next trip!)! That was the first time I had even heard of such a thing and now I must find them locally asap! Daryl and I both had burgers and fries. He chose sweet potato fries and I had truffle fries (yum!). The food was all really good once again! After dinner, we headed back to our hotel for the night. We stayed at Comfort Suites in West Warwick, Rhode Island. The staff was very friendly, and the room looked as if it had been recently updated and was very clean. The beds were comfortable as well! We enjoyed the hot continental breakfast the next morning before getting back onto the road to head to Portland, Maine. I would definitely recommend this hotel! We went through Ebates and booked online with Hotels.com. The whole process was easy and we didn’t have any issues with any of our hotel reservations! Overall we absolutely loved Rhode Island. The scenery is gorgeous and there is a lot to do! It appears to be a clean, well-kept state. Jaxon loved it so much he now has his little heart set on moving there. I would be okay with that too! Now, we just have to get Daryl a job, ha! I wish we had planned to stay there longer, but we were just as excited to check out Portland, Maine! 100 things to do with kids in Rhode Island is a fantastic site I was born and raised in R.I. and didn t realize there were so many things to do. We had no idea really, we only planned one day there but it was definitely a packed day and so fun! It really was! I want to go back! 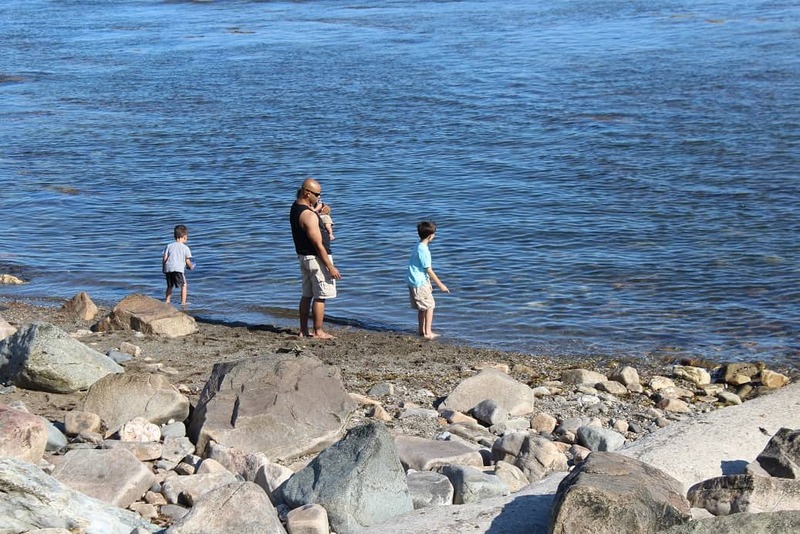 There was a lot to do – my son could have explored the rocks/water all day! Rhode Island look absolutely stunning! LOVE your pics. Thanks Terryn! I should probably start posting about my upcoming trips so I can get advice or plan meet-ups before we go! Newport was beautiful! We all really want to go back! How fun! I love Rhode Island. 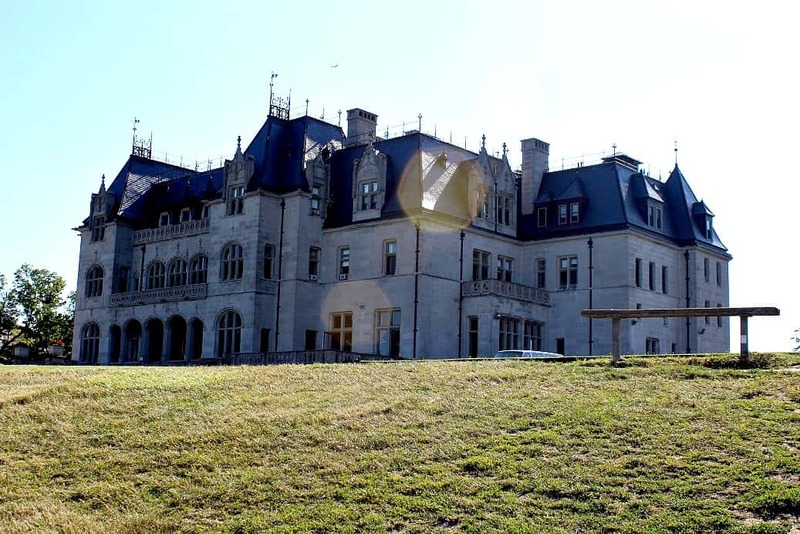 The Newport mansions awesome to explore! 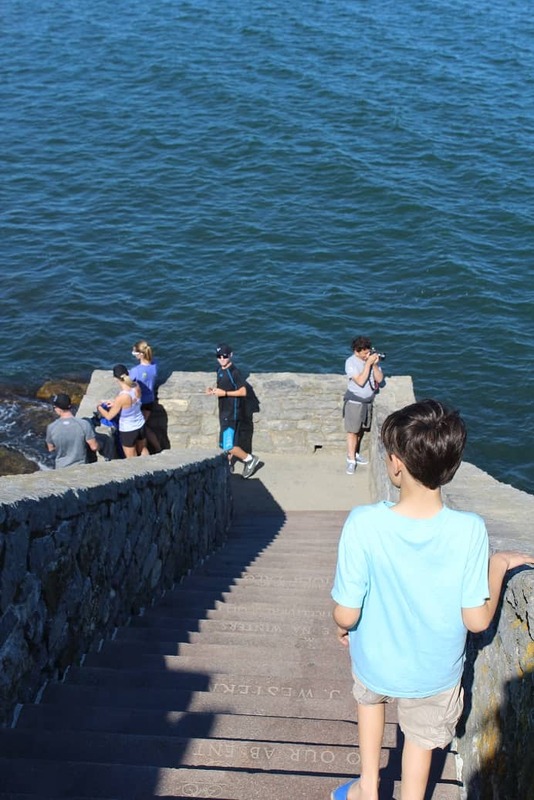 We did a portion of the Newport Cliff Walk – it was gorgeous! I would LOVE to visit Rhode Island someday! Will definitely reference this post when I do! Thanks for sharing! What a cool place! We haven’t been to that part of the U.S. yet, but I hope to visit that area one day soon! Oh definitely, but worth it! I grew up in NY and have done much of the Northeast, except Rhode Island! Need to go! Thanks! I hope we make it back! I hope you make it soon!! I have never been to Rhode Island very nice to see it through your eyes. Very pretty state. We did! I really wish the food pics came out better because it was all so good! I’ve never been to Rhode Island (I’m way down in Florida) but it looks absolutely beautiful! I’m definitely going to add it to my list of places I want to see! My parents live in FL – I know how long the drive is to here! Def take a plane if you visit haha! Wow seem like you and your family had a great time Rhode Island is a beautiful place. Yes – it was awesome! I’ve never been there but it looks amaizng!! That food all looks so fabulous!! It was such a great place to visit for sure!